It's finally here, the Wii has arrived in the UK and its time to play. The sun rose over a cold and bitter English morning, it was like any other normal day, except today the Wii would finally be in my hands. 7.00am - I wake to the annoying sound of my alarm clock, usually it gets a beating but today I was nice, it was time to get up (unusually early for me) as I had an appointment in Leicester at 9.15am, an appointment that might make me miss the Wii delivery. I navigate over to FedEx.com and check the status of my package, good news those three magic words, "Out For Delivery". 7.50am - I have to leave the house, the FedEx man still hasn't arrived. 9.00am - I reach the appointment check FedEx.com on my phone, its still out for delivery, no missed attempts. I rush through the appointment and scurry back home asap. 10.30am - Home, but no delivery in sight, my neighbour notices I'm home and comes over, "I have your package" he says. Music to my ears as I rush over to collect it, the box is rushed straight upstairs and the unpacking begins. The box seems small, but weighs more than I expected. Opening the box reveals two trays, everything is neatly packaged and wrapped in plastic or padding. 10.40am - Setup. The first test, will my step down transformer work? With the power cable connected, a small red standby light appears, we are go. Hooking up the AV cable and sensor bar are a breeze, the sensor bar is barely noticeable aloft the Plasma screen. Remote in hand, I turn the console on for the first time. Disaster, the picture is in black & white, surely this screen can handle NTSC? With a quick manual check I realise it has to be set manually, problem solved as the screen turns into full colour. Waving the Wiimote allows you to setup the console, setting a date, time, screen ratio and a few other little things. One thing that really stands out, the controllers are REALLY small, smaller than I expected. Check out the comparison to a Xbox or Gamecube controller. 10.45am - Wii Sports, with an extremely simple menu its quick and easy to get started, I bash through a few games of Tennis, its hilarious and great fun. You find it easy to get into a long rally from the off, hitting forehands and backhands as if you were playing the real thing. Obviously the accuracy of real tennis isn't here, but you do need to time your shots correctly. 11.00am - Wii Sports Bowling, another title that's great fun straight from the start. Its very simple and easy to get started, you'll find yourself hitting spares within your first round. 11.30am - I really have to get to work It's clear to see that Wii sports is a great introduction to what Wii is all about, the motion sensing on these games is simple, but effective. I look forward to playing more when I get home after work. 6.00pm - Home from work and I've just given Red Steel a good 30-40 minute blast, my first impressions are mixed, the presentation of the game is pretty bad, the menus are awkward and the loading screens even have a little spinning disc ala PSOne. Into the actual game and the graphics aren't too hot, maybe that 480p mode will improve things, the controls are alittle "tricky". There's quite alot of different movement to be aware of, but coming to the end of the session I'm starting to get the hang of it. It's okay so far and should hopefully become more enjoyable as I continue to learn the controls. 7.00pm - Need to head out again, damn you cruel world, can't you just let me play on the Wii some more? 10.00pm - You can instantly tell that Super Monkey Ball: Banana Blitz is a much more polished game than Red Steel, everything about the menu system is great and easy to use, its everything you'd expect from a Monkey Ball title. You can imagine the reaction of the Sega developers, this is a dream game for the Wiimote. After only completing the first world of single player mode, I can tell I'll be spending MANY more hours on this game over the next couple of months. Great work Sega. 11.30pm - We've heard lots of reports of Wii consoles having fatal errors when they get updated via the WiiConnect24 service. I know alot of you have asked if this will work in the UK, so I've put it to the test. Configuring the Internet Connection was a breeze, the system located my Belkin 54G Wireless router, and instantly started to download the updates... after about a minute of downloading the update was complete, reboot and we're back to the main menu. Wii Shop is now live, and Virtual Console games are available for purchase. Your given the option buy "Wii Points" directly from a credit card, excellent. 11.45pm - Freeloader, it's getting late so I gave this a quick try... I loaded the freeloader disc, and proceeded to eject and enter a PAL Gamecube disc, Super Mario Sunshine. Now, the sound worked but my TV went black, no picture. This isn't to say that Freeloader doesn't work and could just be my TV, I'll investigate further tomorrow with PAL, JAP and USA Gamecube titles. 11.55pm - Photo Channel. Had a quick go at this, its pretty cool. By the looks of it, if your mobile phone has Bluetooth, the Wii can automatically view the photos on the TV, interesting! Well, its come to the end of the first day of Wii. Hopefully I'll get more time over the next few days to play the console and all of the games. Please feel free to keep asking me questions, I'm more than happy to help Goodnight all. You lucky git! I can only look on and dream. It's good to see that Nintendo have included a semi decent brand of batteries (Maxell) rather than the unheard of brands that most consumer electronics dish out... I bet they run out fast though.. crack out the duracells asap! As for the remote strap, I imagine that there will be lots of 3rd party straps out soon that will combat the problem. I'm amazed that people are letting them go out of their hands... are they complete imbeciles!? What size are the CD's I know the Wii takes both but from the games you got, do they use the smaller CD or the normal size? 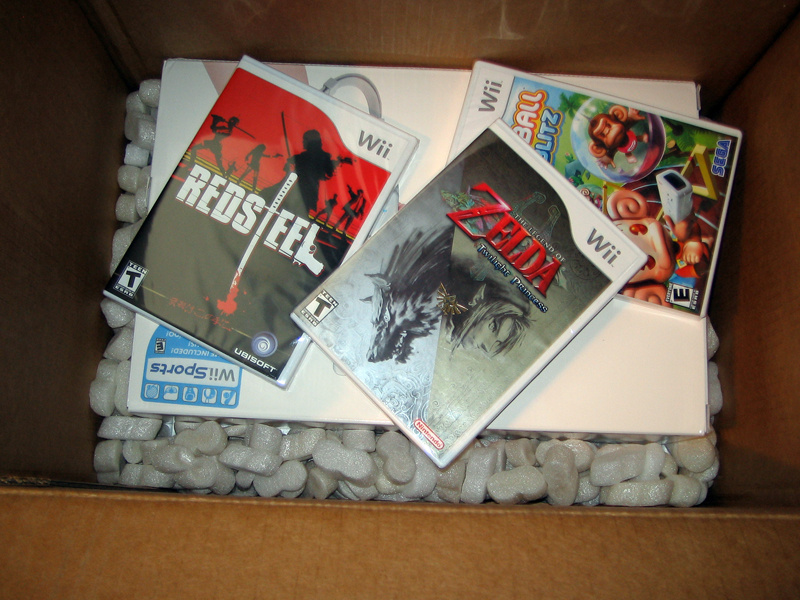 Wii uses standard DVDs for Wii games, and of course Mini-DVDs for Gamecube games. just a thought regarding the strap issue... is it possible to use the original DS one?!? I think its possible to change the strap, its just like ones that come attached to digital cameras etc... My DS didn't actually come with one! I was robbed. Good review, can't wait till I own one of those bad boys. Any luck getting the freeloader to work? ( i ll probably import a US console but want to have two options.. still a bit unsure because of the update brick that seems to have hit some consoles.